Does conferring have you frustrated? 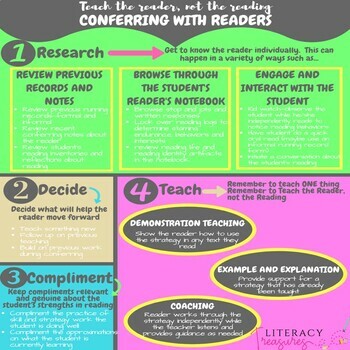 Does the 4 steps to conferring with readers seem like SO much? Conferring with readers doesn't have to be as time consuming and as difficult as it sounds. Check out these reminders and tips for moving through the steps for conferring with readers. Here's a quick glance at the 4 steps of the conferring cycle set out by Jennifer Serravallo. Glue this to the top of your conferring notebook or to the back of your conferring clipboard and get to conferring!